This represents '#pragma omp flush' directive. In this example directive '#pragma omp flush' has 2 arguments- variables 'a' and 'b'. 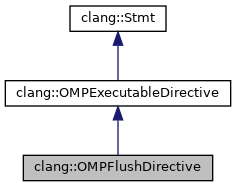 'omp flush' directive does not have clauses but have an optional list of variables to flush. This list of variables is stored within some fake clause FlushClause. Definition at line 2067 of file StmtOpenMP.h. Definition at line 2111 of file StmtOpenMP.h. Clauses List of clauses (only single OMPFlushClause clause is allowed). Definition at line 613 of file StmtOpenMP.cpp. Definition at line 626 of file StmtOpenMP.cpp. Definition at line 2068 of file StmtOpenMP.h.